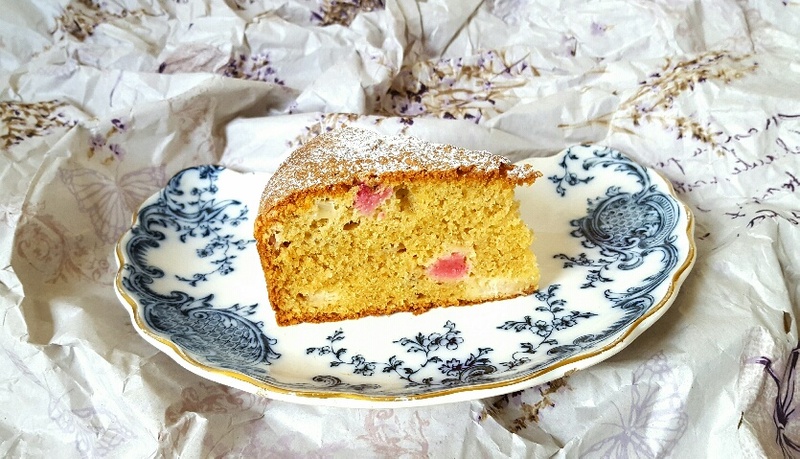 This rhubarb and ginger cake is one of those delightful ‘chuck all of the ingredients into a bowl and mix’ jobs, a cake baking technique that’s a firm favourite with me. I’ve written before about the ‘generosity’ of gardeners in their ‘donating’ of rhubarb to me and with the turn of spring this year has turned out to be no different. (I jest, of course.) My Dad gave me a lovely bunch of lurid, thin pink rhubarb stalks the other day and although I’d been debating about making them into a jam, after flicking through Emma Hatcher’s The FODMAP Friendly Kitchen Cookbook I decided to try making her rhubarb polenta cake. When I read that the flour base of this rhubarb and ginger cake was polenta, ground almonds and gluten-free flour I strongly suspected that the cake would be dry and tasteless, but from the minute I started mixing the cake together I could see that this assumption was very wrong. It mixed together like a ‘normal’ cake would without the granular texture I’ve come to expect from gluten-free cakes and baked very well indeed. The base ingredients of this cake work so well that this could easily become my go-to gluten-free cake mix to use with other flavours. 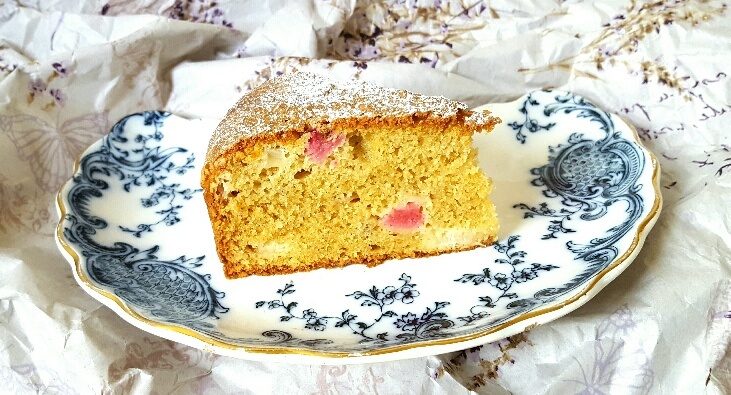 Accordingly, the finished product is a light, moist vanilla-scented cake that’s generously dotted with little chunks of soft, tart rhubarb and complemented by the warming presence of the ground ginger. The rhubarb and ginger cake is beautiful on its own, but I think it would lend itself well to a dollop of crème fraîche or a dairy-free equivalent. However you serve it, I guarantee it’ll be well received by all. Also, if you want to try the original recipe from Emma’s book you can find it online on her publisher’s website here at Yellow Kite Books. Prepare an 8″ cake tin with greaseproof paper or a cake tin liner (a wonderful invention which makes cake baking infinitely easier than having to cut out circles of greaseproof paper to fit your tins!). Measure the dry ingredients into a large mixing bowl and give it a good stir so that they’re all fully mixed. Measure the wet ingredients into a jug or bowl. Toss the rhubarb in the dry ingredients and then add the wet mixture and stir really well. 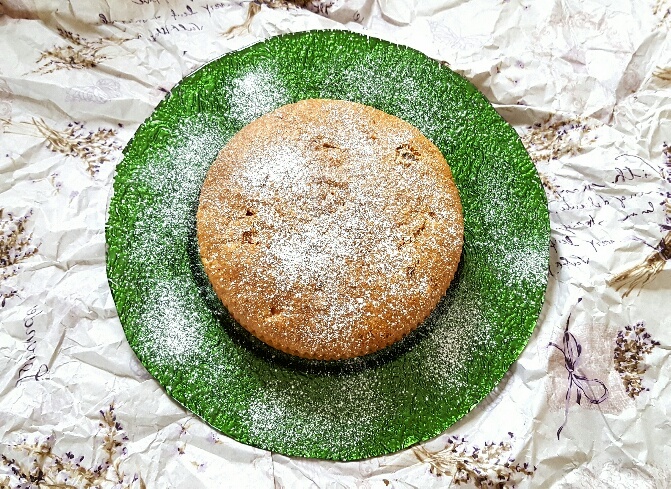 Pour into your cake tin and bake for 35 to 40 mins or until a skewer pushed into the centre of the cake comes out clean. Leave to cool and then serve.